Relationships at start and finish, love at first and last sight drive the newest work from playwright John Cariani, Love/Sick at TheaterWorks. Make sure you catch that “alternate reality” part, because unless you are willing to let go of reality, and give Cariani some room to create some "sick" characters and situations, you won’t enjoy a lot of the humor. 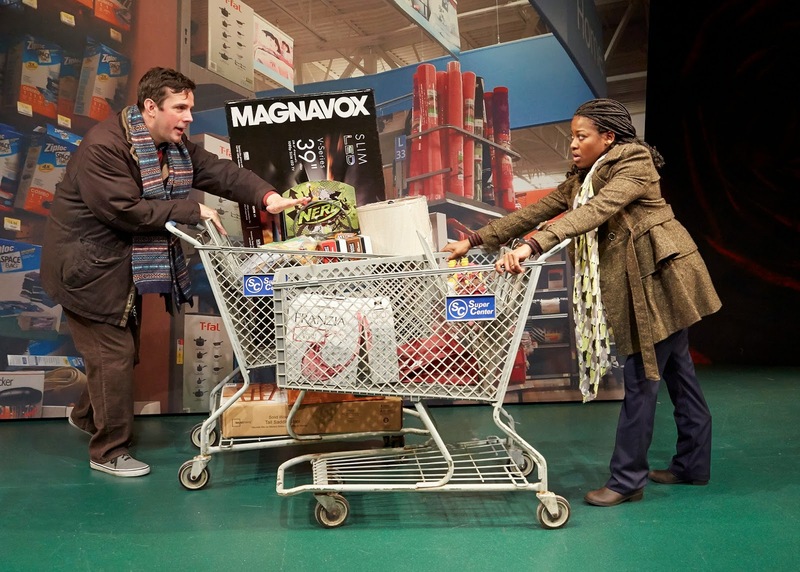 The playwright makes this clear with the first sketch, “Obsessive Impulsive,” where a Man and a Woman (Reed and Woodward) run into each other at the Super Center and immediately start making out. They try to stop themselves, but as they apologize and try to explain (in exact unison), we discover they suffer from Obsessive Impulsive Disorder, which makes it difficult for them to keep from acting upon impulses. Have they fallen in love at first sight or are they just unable to control a physical attraction? It’s funny, but bizarre. Thorn stands out in the next sketch “The Singing Telegram,” when, on his first day on the job, reluctantly delivers a singing missive that doesn’t contain a message its recipient, (Armand), is expecting. He’s embarrassed, awkward and deeply sensitive. · “The Answer” where a bride with cold feet confronts her groom-to-be in the bathroom, just moments before their wedding to demand that he propose again. · “Uh-Oh,” a bored wife is driven to extremes as she tests the devotion of a husband, who sits on the sofa, unaware as he is absorbed by the lure of his IPad. · “Lunch and Dinner,” one of the funniest sketches, where a husband and wife speak in double entendre about finding satisfaction outside of their relationship. · “Chicken,” the most disappointing of the sketches, where a husband asks for a divorce and regrets that his wife ever introduced herself because now he doesn’t remember what it was like to feel lonely (also at the Super Center, which creeps into a number of the sketches, as does a flower theme). · “Forgot” about a woman who’s biological clock is ticking like a bomb that might blow up her marriage. Added depths of humor would have been possible if Saltz had coaxed some nuance from Armand who shouts many of her lines in the Singing Telegram sketch. We get a hint of what might have been possible when she tones down for a minute in the “Chicken” sketch and the result is very funny. Woodward (who was in Almost Maine last season) stands out bringing energy and added layers to characters. She and Thorn have visible chemistry on stage. The evening at two hours and 15 minutes with an intermission feels a bit long (cutting that Chicken sketch might do the trick), but overall Love/Sick is entertaining and fun. · Talkback Tuesday's: May 27, June 3, 10, 17. An intimate conversation with cast and crew after the show. · Added matinees on Wednesdays June 4 and 11 at 2 pm. Love/Sick runs through June 22 at TheaterWorks, 233 Pearl St., Hartford. Performances are Tuesdays, Wednesdays and Thursdays: 7:30 pm; Fridays and Saturdays: 8 pm; Weekend Matinees at 2:30 pm; Wednesday matinees June 4 and 11. Tickets $15-$65; 860-527-7838; www.theaterworkshartford.org.